I created this site to house all my gaming-related resources, including game server statistics and announcements, as well as gaming-related discussions, polls and a few downloads. 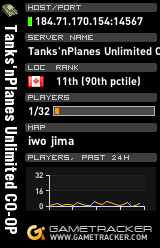 In particular, this site is a home on the web for anyone who plays Battlefield 1942 on the Tanks 'n Planes Unlimited server. Fire me an email at jrivett@jdrgaming.com to let me know if you see anything broken or would like to suggest any changes. I can also be reached at jr0002@shaw.ca. You can also chat with me any time via Skype, where I'm jeff.rivett. I operate a computer consulting business, Jeff Rivett Consulting. These days I mostly provide IT services, and develop and maintain web sites for various businesses and organizations. If you know anyone who needs a web site, or who has a web site and needs someone to manage it, please point them in my direction. I also run a technology blog, Boot13. I write about Windows, Linux, security, tools and other computer-related subjects.